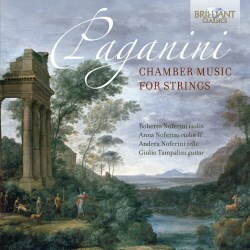 This CD features some rarely recorded chamber music by Niccolò Paganini, the violinist “possessed by the devil”, great innovator of his instrument and composer of delightful, brilliantly written music of great melodic invention. It is performed here by Roberto Neferini together with two of his family members and the Italian guitarist Giulio Tampalini. The majority of the compositions presented here are tuneful, sunny and charming. This is light, unpretentious music and those who have a soft spot for the Rossini string sonatas will certainly enjoy this. Paganini and the young Rossini shared a similar melodic gift and there are also some dashing movements such as the sparkling third Ritornelli. Paganini was also an expert guitar player and the Sonata concertata utilises the instrument to great effect. I especially enjoyed the intimate musings of the central Adagio and the jolly, optimistic Rondeau. The 6 Preludes for solo violin are in a similar vein as the 24 Caprices but maybe without their fiendish level of difficulty. They still possess those unmistakable Paganini fingerprints. The Moto perpetuo is so well known it hardly needs comment. It’s a frivolous miniature that has been recorded in many versions including those for full orchestra, flute and orchestra and in this case violin and guitar. The Cantabile is another example of Paganini’s ability to write graceful, singing melodies in an operatic style. We then come to the Preghiera del Mosè. Following the opening 4 minutes of melody, Paganini gets up to his well-known virtuoso tricks, stretching the player to perform circus stunts of incredible difficulty. I personally find it all very hollow and uninteresting and the sul G passages aren’t always perfectly in tune. The playing is good rather than outstanding. There are occasional intonation issues and minor inaccuracies in some of the more virtuoso passages. The recording is clear but uncomfortably close, capturing some ugly violin sounds that wouldn’t have been picked up in a more generous, helpful acoustic.